Jose Ramirez is one of six Indians on the American League team. When Major League Baseball’s All-Stars take the field Tuesday night in Washington, the Cleveland Indians will be quite well-represented. With starting third baseman Jose Ramirez leading the way, the Tribe has six total players on the American League roster, tied with the Houston Astros for the most in MLB.1 It’s a fitting honor for this star-powered season in Cleveland: The Indians currently boast four players — Ramirez, Francisco Lindor, Trevor Bauer and Corey Kluber — each on pace to put up at least six wins above replacement,2 which, if it holds up (grain of salt), would tie them for the most by any MLB team since 1901. That kind of star performance is nothing new for the Tribe, though. Since the All-Star Game began in 1933, only seven franchises (the Yankees, Cardinals, Red Sox, Dodgers, Reds, Giants and Braves) have sent more total players to the midsummer classic than Cleveland has. And no team’s top players have done more to help their league win during the game itself, especially on the pitching side. The franchise may not have won a World Series since 1948, but it does shine brightly on at least one high-profile stage. In terms of value from batters (per season that both the team and the All-Star Game existed), the Indians rank fifth behind the Cardinals, Red Sox, Tigers and Diamondbacks. That’s pretty good, and it comes thanks to players such as third baseman Al Rosen (career 1.247 All-Star OPS, or on-base percentage plus slugging) and catcher Sandy Alomar Jr. (who was named MVP in 1997). But the pitching side is where Cleveland has really distinguished itself, easily ranking No. 1 among all franchises (topping the Dodgers and Reds). That’s largely due to the efforts of 1930s/40s-era Tribe hurlers Mel Harder and Bob Feller, who show up as the top two pitchers in All-Star history according to WAR. In 25⅓ combined All-Star innings over nine appearances, that pair allowed just 1 earned run, good for a miniscule ERA of 0.36. Now, we should note that it’s no coincidence the All-Star Game’s most valuable pitchers played early in the game’s existence. Back then, pitchers like Feller were allowed to log three to four innings at a time, as opposed to today’s trend of letting each pitcher on the roster get about an inning of work apiece. Obviously, it’s easier to rack up big WAR totals if you get to throw more innings — provided you’re effective the way Harder and Feller were. But that isn’t to say no modern players are near the top of the All-Star WAR ranks. Mariano Rivera ranks ninth among pitchers after allowing zero earned runs in nine innings of work, and Randy Johnson ranks 11th. On the hitting side, Derek Jeter enhanced his status as baseball’s biggest star with a 1.184 OPS and the third-most All-Star WAR of any position player.5 And Mike Trout is zooming up the list — because of course he is — with a 1.533 OPS and the seventh-most WAR of any hitter, compiled in only five appearances. 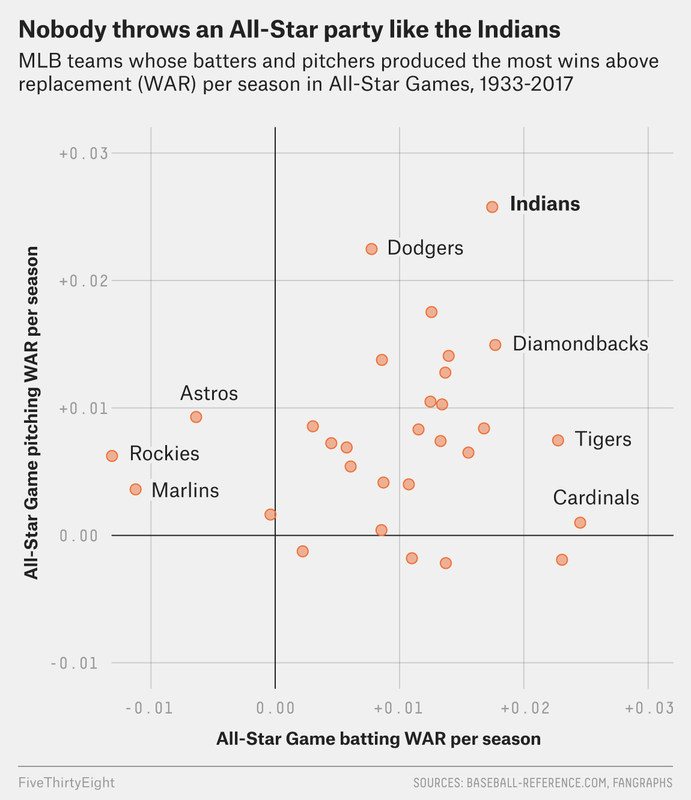 Speaking of modern entities, at the other end of the All-Star WAR spectrum from the Indians are the Miami Marlins and Colorado Rockies, who look terrible even after adjusting for how comparatively few chances they’ve had to rack up appearances. (Each franchise entered MLB in 1993.) Interestingly, the Astros join them among the teams whose players have done the least in the All-Star Game over the years. Houston has had plenty of top-line talent to represent it, but Jose Altuve and Craig Biggio combined to go 1-for-23 in their All-Star appearances, and Roger Clemens gave up 3 earned runs in two innings as an Astro, to go with a handful of other high-profile flops. The good news for the Astros is that they’ll get a bunch of chances to reverse that trend in Tuesday’s game. At the same time, the Indians will get plenty more opportunities to pad their all-time numbers. Bauer and Ramirez might never catch up to Feller and Rosen, but they do have a lot of illustrious history on their side. Including both original All-Star picks and injury replacements. Averaging together the WAR values found at Baseball-Reference.com and FanGraphs. Though I did adjust for position. I also applied an adjustment for the leverage index of a pitcher’s innings, although I ditched WAR’s usual distinction between pitching stats for starters and relievers. In the All-Star Game, most pitchers are used in the manner of a typical reliever — for just an inning or two — even when they start. This is the part where I reiterate that this simple version of WAR doesn’t factor in Jeter’s astonishingly bad defense relative to other shortstops.